The Topsfield Highway Department is located at the Public Works Facility, 279 Boston Street, also known as Route One. The Facility is a state of the art, pre-engineered building, built in 2000 and houses the staff of both the Water Department and Highway Department. The site also contains a sand and salt storage facility, recycling center, composting area, and a centralized fueling depot for all of the Town's vehicles. The Highway Department is responsible for the overall maintenance and upkeep of the Town's road and bridge infrastructure. Topsfield has approximately 60 miles of roadways, 25 miles of sidewalks, 1500 catch basins and manholes, 6 bridges, and countless miles of drainage pipe. The Department handles many tasks throughout the year including street sweeping, roadside mowing, brush clearing and removal, tree trimming and removal, catch basin cleaning, snow and ice control, street paving, road reconstruction, sidewalk paving, vehicle maintenance, drop off recycling, and brush and leaf composting. We currently have five employees, all trained at various levels of heavy equipment operation, truck driving, and fleet maintenance. The Highway Department is governed by an elected Board of Road Commissioners who serve staggered 3 year terms and is administered by an appointed Highway Superintendent and one part time Administrative Assistant. The Commissioners set policy within the department, review and prepare the budget for Town Meeting, consider capital purchases and expenses, and promote the department's annual road improvement program. The Commissioners meet regularly on the third Friday of the month to conduct department business. The Highway Department has an aggressive road and bridge maintenance program that has been in effect for over ten years. It has always been the policy of the Highway Department to be as cost effective as possible when it comes to maintaining and rebuilding the Town's roads. To that end, in the mid 1990's, we commissioned a study of the Town's roads to determine if the level of funding that the we were asking for from the taxpayers of Topsfield was indeed enough to maintain good quality roads. It is proven that if you don't maintain the infrastructure regularly, the cost to repair and reconstruct will be significant. The outcome of that study showed the Town should be spending approximately $ 325,000.00 per year on it's road system. 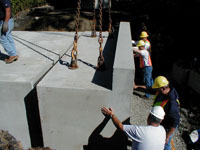 The funding for road and bridge maintenance comes from a variety of sources, such as Town Meeting, State Chapter 90, and occasionally from the Massachusetts Highway Department. In the past ten years, we have secured over 1 million dollars in additional state money and have been approved for an additional 3 million dollars of future funding for some special projects that we have planned. Most of the funding for these projects, including Chapter 90 for our local roads, comes from the state gas tax and the federal gas tax. The annual operating budget for the Highway Department is approximately $510,000, including $150,000 for snow and ice control. Our Snow and Ice Control Guidelines, as well as other useful Highway Department information, are available online at www.topsfieldpublicworks.org. The Highway Department office can be reached at 978-887-1542. The Highway Department currently has 1 Foreman, 2 heavy equipment operators, 1 mechanic, and 1 truck driver who are all involved in snow operations with the Town. We also use as many other Town Department employees as possible. Plowing operation activities also include the hiring of approximately 10 pieces of equipment from outside contractors. At a minimum there will be at least 10 pieces of equipment out on the road, but generally up to 20 pieces is not uncommon. Other town department personnel will assist in snow activities such as wing operators or equipment operators during plowing operations. Welcome to Topsfield's Stormwater Management and Erosion Control site. 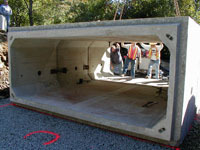 The Town filed a Stormwater Management Plan with the Massachusetts Department of Environmental Protection (MassDEP) in 2004. The plan was approved and the Town now has a National Pollutant Discharge Elimination System (NPDES) permit to operate our stormwater collection system. The five-year plan outlines the steps the Town will take to reduce water pollution by improving the quality of our stormwater and to the amount generated.